Fjord Line's terminal in Sandefjord can be found close to the centre of Vestfold town. From here you're just a short walk away from great restaurants and other attractions. Welcome to Sandefjord and Vestfold county – the place where Vikings ravaged, traded, battled and left behind many visible traces. In this region, whaling ensured prosperity and stable growth for over 100 years. The locals of this area claim it as Norway’s sunshine coast. Fjord Line’s terminal in Sandefjord is located at Tollbugata 5, well situated among the restaurants and bars in Brygga. 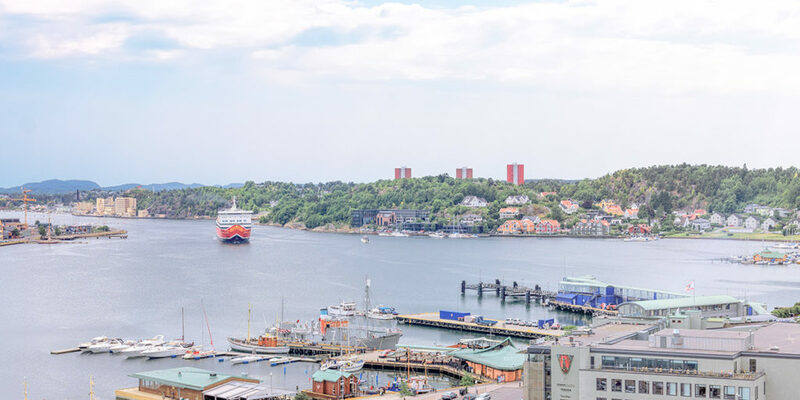 We highly recommend you set aside some time to discover everything Sandefjord has to offer, especially if you’re visiting in summer. But don’t forget your sun cream! Vestfold has more hours of sunshine per year than anywhere else in Norway. It’s not just the summer sun that makes Sandefjord such a desirable destination. Winter also offers a wide range of activities that are worth checking out. If you’re here during the colder months, the Whaling Museum is well worth a visit. The same applies to Midtåsen, the splendid home previously owned by renowned shipowner Anders Jahre. From Sandefjord it only takes 10 minutes to the E18 and the Norwegian road network. Fjords Line’s terminal in Sandefjord can be found close to the centre of Vestfold. From here you’re just a short walk away from great restaurants and other attractions. Yes, on the 1st floor in the terminal building. Communal parking spaces by the terminal. Parking charges are NOK 51 per day, max 24 hours. Communal parking spaces opposite Scandic Park Hotel. NOK 30 per day. According to Sandefjord Port Authority regulations, motorhomes cannot be parked in the port overnight prior to travelling the following day. Motorhome owners can park by the Sandefjord Boat Club, between the petrol station and Scandic Park Hotel, for NOK 150 per night including power. Ask at the petrol station kiosk which is located right opposite the motorhome park. Would you like to explore Sandefjord a little more? Here are a number of attractions that are guaranteed to leave a lasting impression in the idyllic Vestfold city. Situated in the heart of Sandefjord, you’ll find Europe’s only dedicated whaling museum. The museum was donated by one of the city’s best-loved residents, Consul Lars Christensen, and was completed in 1917. Here, you’ll get a real insight into the city’s extensive whaling history and its many personalities. And there’s also an introduction to wildlife and birdlife in the Arctic and Antarctic environments. It’s almost impossible to talk about whaling without mentioning Anders Jahre (1891-1982). To the outside world, shipowner Jahre was the face of whaling. The 1,200 square metre Midtåsen villa was Jahre’s home, with its idyllic location on a hill above the city. With an almost unbeatable panorama, Midtåsen is one of Vestfold’s most famous properties. Historic figures such as Aristoteles Onassis, the Shah of Iran and even King Olav V have come to visit! If you combine this with a visit to the Whaling Museum, we promise you’ll get a rare glimpse of the golden age of whaling. Sandefjord is the city that all of Norway associates with whaling. The inner port holds the monument that perpetuates the city’s status as the “whaling city”. Sculptor Knut Steen (1924-2011) was commissioned to build a monument to honour the pioneers of whaling. You can see the finished result right next to the ferry quay, in the middle of the roundabout on Fylkesvei 260, with Badeparken and the venerable Park Hotel (also designed by Arnstein Arneberg) its closest neighbours. The Viking period forms a major part of Vestfold’s history. Here in the sunshine province, a great deal of trading activity took place, leaving behind many traces of the early settlements. History enthusiasts should not miss a visit to the Gokstaud Mound. It’s a large burial mound, constructed around 900 AD, which can be found on Gokstad farm. Many objects including human and animal bones were found inside the grave, as well as the famous Gokstad ship which is now on display at Bygdøy in Oslo. In the neighbouring town of Larvik, you will also find Kaupang, which was Norway’s first market town in Viking times. This cosy and central street survived the large city fire in 1900, and it has kept its wonderful 19th century character. The painted white wooden houses which were once built by the returning sailors dominate here. Bjerggata is a cosy and sheltered part of the city, not unlike the streets that make up the old district of Stavanger. Follow signs to Sandefjord, and then the Strömstad sign with the ferry symbol. To check-in a car or motorcycle, follow the signs to the ferry terminal when you arrive. For public transport and bus routes in Sandefjord and Vestfold, see www.vkt.no and www.ruter.no.